So I have to be honest, I’m a huge Pinterest nerd. I love it. It’s perfect for my instant gratification needs. And, because I’m me, I often frequent the “Geek” boards. Now, one thing troubled me about these boards—all of the Dr. Who references. I didn’t understand a single one of them. I had not one notion as to what a “Tardis” could be or why “Bad Wolf” is cool. I pride myself on being pretty with it when it comes to most things “geek.” True, I’m not a gamer, but … I digress. My lack of Dr. Who knowledge concerned me because it is obvious he has quite a following. Coupled with the fact he’s been around for decades, well, something had to be done. Furthermore, one of my favorite shows, Community, frequently spoofs Dr. Who, and it bothered me that I didn’t get the jokes beyond what was on the surface. So, I put out an SOS. I needed any friends with Dr. Who access to help me. 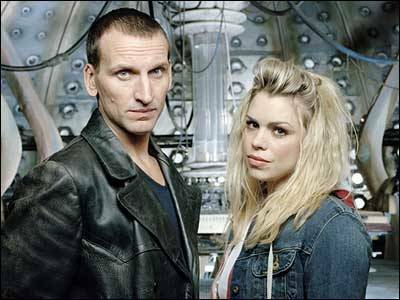 As fate would have it, a coworker quickly came to my rescue and gave me the entire Dr. Who season starring Christopher Eccleston, who I’m to understand is the Ninth Doctor and proved instrumental in the Doctor’s 2005 revival. Later that week, I put in the first DVD and watched the episode featuring mannequins come to life and introduced Dr. Who to Rose Tyler, played by Billie Piper. I won’t lie to you—I hated it. I didn’t realize it would be so campy with such terrible special effects. I wanted to quit after that first episode. The second episode, where Rose got to witness the end of the world, wasn’t much better. The third episode featured Charles Dickens, and I thought it was actually pretty cool. In fact, it marked the moment that Dr. Who began to win me over. But then the next two episodes were pretty bad again. Finally, last night, I watched the episode where Rose goes back in time to save her father from dying, only to muddle up the time stream as a result. Ironically, she has to watch him die all over again if humanity is to survive. I found this episode touching and even felt my eyes tearing up on occasion. By the conclusion of this particular episode, I realized something: I cared about Dr. Who and Rose. It sort of snuck up on me. Overall, the show doesn’t seem to have much quality in terms of production value, and maybe that’s part of the charm. But, Eccleston and Piper have real chemistry, and they make me root for these characters thrown into such ridiculous storylines with horrendous sets and costumes. I’m going to finish this set my friend gave me. I owe it to the geek within to gain some familiarity with Dr. Who. I’m even starting to like it a little bit. Comments are more than welcome! I understand Dr. Who fans are an impassioned bunch, so feel free to support him! This entry was posted in Opinions/Editorials and tagged billie piper, christopher eccelston, dr who, rose tyler. Just keep watching! The production and storylines get better in the next season. Careful, it’s addicting! I just started the first season with the 10th Doctor, and I already love it!